#MeToo, Now What? is a new series of five half-hour programs coming to CPTV Sundays at 9:30 a.m. beginning February 4, 2018. The series will also air Sundays at 5:30 p.m. on CPTV Spirit beginning February 4, 2018. 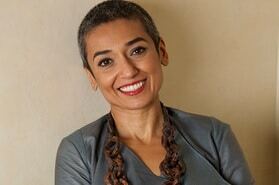 Hosted by executive editor Zainab Salbi, founder of Women for Women International, this series goes beyond the headlines. In the current moment, with sexual harassment at the forefront of the national conversation, #MeToo, Now What? aims to take the discussion to another level, and seeks to answer this question: How did we get here, and how can we use this moment to effect positive and lasting change? Each episode will focus on an aspect of sexual harassment, and will include reporting from Salbi both in the field and in-studio as she facilitates open and authentic conversations. Topics to be explored include the impact of popular culture on women in the workplace; how race and class factor into the discussion; the social costs of pay inequity and gender discrimination; how men can be engaged in this discussion; and, ultimately, how to chart a path forward. #MeToo, Now What? will draw from a range of guests, including women and men of all ages, races, and economic groups — and ordinary citizens from across the nation. Salbi will also welcome activists, journalists, celebrities, and leaders from the worlds of media, academics, business, entertainment, and more.